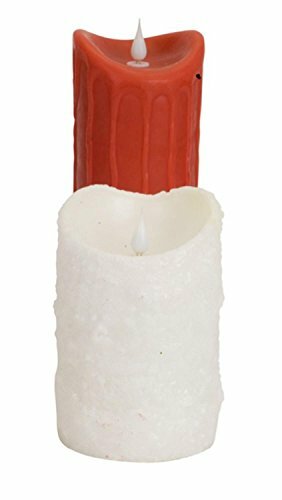 4 White Dripping Wax Textured Flameless LED Lighted Pillar Candles with Moving Flames 6'' by Melrose at Two Clock. MPN: 31489029. Hurry! Limited time offer. Offer valid only while supplies last. Flameless candles give the warm, inviting glow of a fire without the actual danger of an open flame. 360 degree realistic, multi-hued moving flame. Club Pack of 12 Artificial Red Mixed Berry Christmas Pillar Candle Rings 10"